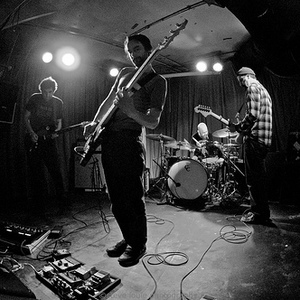 The Appleseed Cast is an indie post-rock band based in Lawrence, Kansas, currently comprised of singer/guitarist Christopher Crisci, guitarist aaron pillar, bassist Nate Whitman and drummer John Momberg. The band's predominately guitar-based music has gradually evolved in a relatively short space of time (arguably due to a combination of line-up changes and natural musical progression) from intense, heavy emo indebted to such acts as Mineral and Sunny Day Real Estate to a unique "post-rock" sound hinging on inventive, intricate drumming, subtle guitar arpeggios and impassioned vocals. The band formed in 1997 in Southern California with Crisci and Pillar joining bassist Jason Wickersheim and drummer Louie Ruiz under the name December's Tragic Drive (derived from lyrics of the song, "Seven" by Sunny Day Real Estate). The following year, the band - now billed as The Appleseed Cast - signed to Deep Elm Records out of North Carolina and released their debut album, The End Of The Ring Wars, an album which met with considerable approval from the emo and underground scenes, as incendiary tracks like "Marigold & Patchwork" were essentially blueprints for the emo style. However, the album was also criticized in some quarters (most notably by Pitchforkmedia) for sticking too closely to a style already well explored by previous acts such as Braid and Sunny Day Real Estate. In 1999, the band relocated to Lawrence, Kansas without Ruiz, recruiting new drummer Josh "Cobra" Baruth. Later that same year they entered the Red House studio in Eudora, Kansas with producer Ed Rose who would go on to produce their next four records. The end result was Mare Vitalis, the band's second full-length album. The album showed progression from the dynamics-heavy rock of The End of The Ring Wars. Essentially a concept album on the movements of the sea (encapsulated in such song titles as "Mare Mortis," and "Poseidon" ), the album is a fan favourite, heavy on atmosphere, crescendo, subtly undulating guitar arpeggios and the percussive, intricate drumming of Baruth, who clearly brought a new dimension to the band's sonic palette. The band completed Mare Vitalis in late 1999, but tensions were developing between the band and Wickersheim. In January of 2000, Pillar asked his roommate, St. Joseph, Missouri-native Marc Young, if he would be interested in playing bass for them, for one show. Young agreed, however the show they spoke of and agreed upon, never materialized. Regardless, Wickersheim officially departed the group that same month with Young replacing him on bass. After touring Mare Vitalis, the Appleseed Cast once again entered the studio in late 2000 to begin work on what would be their most ambitious project to date. Eager to fulfill their five record deal with Deep Elm, the band embarked on a double LP, with Ed Rose once again at the helm. Low Level Owl Volume One was released on August 21, 2001 with Volume Two following on October 23. The tracks were woven seamlessly together into album-length soundscapes, revealing a hitherto unnoticed post-rock influence. The complex vocal arrangements and enigmatic lyrics were buried in the mix underneath simple, repeated guitar riffs, swathes of keyboards and found sounds, and Baruth's inventive, intricate drum patterns. The pieces containing vocals and lyrics were connected by ambient-influenced instrumentals. The Low Level Owl albums seemed both to be a natural progression from the more song-oriented Mare Vitalis and a complete shock, the previously disparaging Pitchforkmedia website giving the project a glowing review. However, some critics were put off by the intentionally repetitive nature, not only of much of the guitar playing but also the ambient instrumental interludes. The band followed their Low Level Owl project with the release of Lost Songs the following year. The album was a collection of songs recorded shortly after the release of The End of The Ring Wars, songs which were considered unfinished. In 2002 vocals and overdubs were added to the "lost songs" and issued as the Appleseed Cast's final release on the Deep Elm label. The Appleseed Cast signed with the New York based indie label Tiger Style Records in 2003 and released Two Conversations shortly afterward. Touring keyboardist Jordan Geiger was officially credited as a band member on the album. Two Conversations was met with mixed reviews. Some viewed the album with dismay, regarding the more conventional song structures, the less diverse sonic palette and the personal, relationship-driven lyrics as a blatant retreat after the no-holds-barred experimentation, depth and complexity of the Low Level Owl project. However, others saw the album as an assured combination of the driving emo-rock of their early work subtly embellished with elements of the Low Level Owl sound. During the recording of the album and the subsequent tour, tensions mounted once again, this time with drummer Josh "Cobra" Baruth. Rumors began to surface in the spring and summer of 2004 that Baruth was no longer a part of the group, and were confirmed on the band's website later that year. Following the confirmation the band went on hiatus. Crisci began working with his side-project Old Canes and Geiger returned to his band, Minus Story. In the meantime Tiger Style, in financial difficulties, was forced to drop the band from their label after just one album. With a new drummer in place, the band was signed by the Militia Group in 2005 and announced they were returning to the studio in October. The recording sessions for Peregrine, the Appleseed Cast's sixth full-length album, were held in Cannon Falls, Minnesota at Pachyderm Recording Studios. The sessions were produced by John Congleton, as opposed to their regular producer Ed Rose. The band returned from the studio later that year and began mixing and mastering the 13 new songs recorded for the album. Lead singer and guitarist Chris Crisci stated on the band's website "...I don't know if I've felt better about a record this early since Mare Vitalis." The album is arguably more eclectic than any previous release in their catalogue, the Low Level Owl indebted piece "Here We Are (Family In The Hallways)" sitting alongside the more conventional, guitar-driven "February" and the stark, electronica of "Mountain Halo." Peregrine was released on March 21, 2006. Nathan Richardson left the band in the summer of 2006. Old Canes drummer Aaron Coker will play with the band during their Autumn tour. Sagarmatha was released on February 17, 2009. When asked about the next album (previously discussed as an entirely instrumental EP) in an interview, Chris Crisci had this to say; "Well, the idea is still there, although it has morphed into a mostly instrumental full length. There's songs that have 45 seconds of vocals and 6 minutes of instrumental. There's songs that are entirely instrumental, and there's one song with complete vocals that clocks in at about 2:30." This was announced on the band's Myspace, where they also uploaded a demo of "Road West", a new instrumental song that will be featured on Sagarmatha. Recording sessions were held at Black Lodge Recording in Eudora, KS with Ed Rose after unsuccessful attempts to arrange John Congleton to helm the recording. The album contains 9 songs in total with a good mix of instrumental and some new things vocally. The song "The New Stage (For So Long)" is supposed to be included in the LP version of the album. Three demos were released on their MySpace; the fore-mentioned "Road West" and more recently "A Bright Light" and "Summer Before." Bassist Marc Young and drummer Aaron Coker have apparently left the band, according to the band's MySpace. They have been replaced with Nate Whitman of Black Christmas and John Momberg of The Dactyls, on bass and drums respectively.